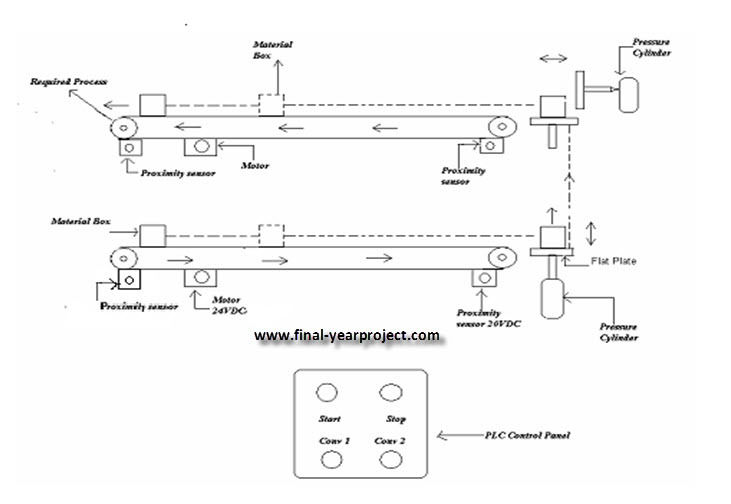 This is a good Instrumentation and control engineering project report on Conveyor Belt using a PLC system. Below is shown the whole block diagram of the system which uses 2 conveyor belt and a PLC panel. Mechanical assembly used in this project are conveyor belt, Dc gear motor, Sensor, pneumatic cylinder. The DC geared motor 1 is used to rotate the driver pulley of the conveyor belt. As the belt moves the material passing on the belt proceeds. Allen Bradley PLC is used in this system. You can also Subscribe to FINAL YEAR PROJECT'S by Email for more such Projects and Seminar. This project is totally based on conveyor belt that is use to transfer the material upward and downward direction. 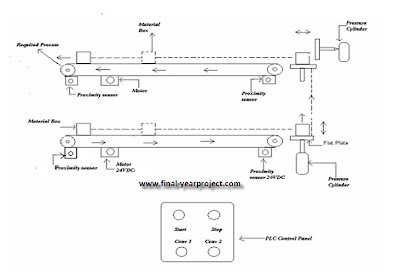 There is use of two conveyor belt first is upper side and other is lower side and there is use of two electrically operated dc motor and proximity sensor to sense the material location and also use the PLC for automatic on off the motor. Use this report only for your reference and study work.